Since I'm still not feeling great from this morning sickness/stomach flu, I decided I was going to be brave and post a belly picture. I feel like I'm the size of a house for only 10 weeks but I guess what they say is true and you really do show quicker the second time. My belly picture from today at 10 weeks. 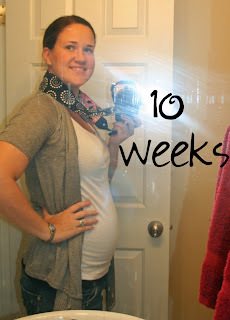 And just for some comparison fun here is a Belly pic from 10 weeks last pregnancy. Before I go, my design cohort Ashley is giving away one of her awesome custom headers over at Mrs. O's Life. She is amazing, and I know because she made my header. So go now and enter to win one of her designs. Yay! Belly! And I love the new header :-) you are so damn cute! Woohoo Double Digits!! You look great!! I am huge already too! and I am only 9 weeks!! lol. I look 4 months!! Love it!! And I love the new header!! What an adorable lil belly!!!! And oooooh yes, second time around you have no abs to hold in your belly LOL quite frankly I look like that after I eat a big meal theses days! I think you look smaller this time around, you are so NOT the size of a house! haha. You look fantastic in both pictures. Pregnancy looks good on you! Is that thrue then that you show quicker the second time? I had heard that and it does seem like I am. I am only 9 weeks but feel like my belly is much bigger than it was last time. 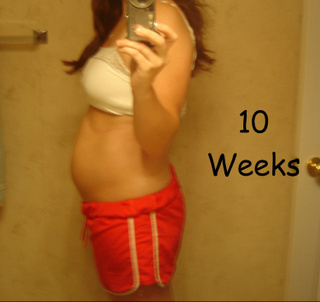 I am sure last time even at 12 weeks I was hardly showing. I am so obsessed with these belly discussions these days. I am only 7 weeks, but swear that my work pants don't fit anymore... I still can barely believe that this is real, and I guess that my growing belly (or maybe we can just call it bloat!) is a pretty awesome reminder.